As a child I recall going to both of my grandparents houses and staring for hours at all of the family photos throughout their homes. I still find myself doing this when I visit my grandmother. It is amazing to see all of the family members at different points of their lives. Even NHL looks at them and names people that he can recognize. My mother and father now have locations in their home that house photographs of family. The other day while visiting I had to take a photo. This is in the back family room where their cockatoo lives, along with my great-grandmother’s piano. 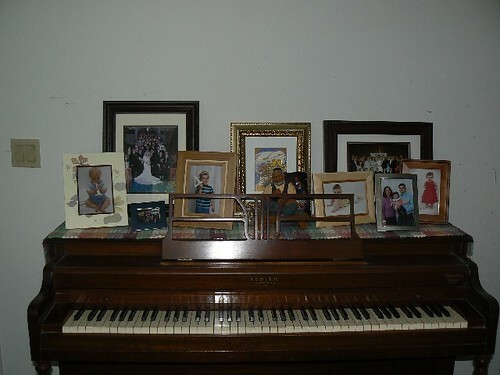 On one side of the piano there is a photo of everyone from my family at our wedding, along with photos of our boys and us. Note to self: Update Nana’s photo of NHL (he’s almost 6 after all) and give them the family portrait that was specially made. On the other a big family photo from my brother’s wedding, photos of his daughter and his family. The digital photography era has it’s perks and drawbacks. We can click away photos to our hearts content and not worry about wasting money on printing photos that are not worthy of processing. On the flip side, we could also store all of the photos and never print out real copies for family and friends….or ourselves. I admit it, we are 110% in the last grouping. Tons of photos taken, but hardly any made into prints for ourselves. We try to get them made for our family, but often are slackers at that. I am trying to get better with this since I hardly have any printed photos of JSL and he is two years old! How do you handle printing of digital photographs? Are you good about getting them made for family, friends and yourself? Any hints or suggestions would be greatly appreciated. We do have that digital photo frame. Of course, that means selecting photos to put on the card & putting that up. 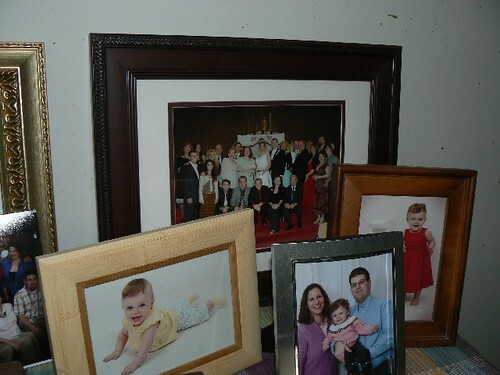 I love looking at people’s family photos too. I had a neighbor whose whole family room wall was covered with photos. It’s probably not something I would do, but I still loved looking at the wall of photos. You probably already know I’m a digital scrapbooker, and I take the best digital shots and turn them into layouts. I just had a book made of them from 2008 by Snapfish. It came out great! Every once in a while, I do get prints made for family and friends. I love putting photos in photobooks. I love you Mommy. It’s funny that this was your recent post because I was just rearranging some of our (many) family pictures yesterday… I LOVE the ones of your boys with the numbers, they both turned out great! Well, we back up our pictures to a separate hard drive but I try to also put them on Snapfish every time I upload (download?) my camera, if I was on my A game (which is almost never) my plan is to order copies every time I put pictures on Snapfish, they’re cheap and saves us having to replace ink constantly. I really have never enjoyed printing photos at home. My grandmother had 2 entire walls in her dining room dedicated to her 4 daughters and their families (I have 3 siblings and 19 first cousins. All but 3 of us are married, all but one of the marrieds have children and most of us have more than 1). 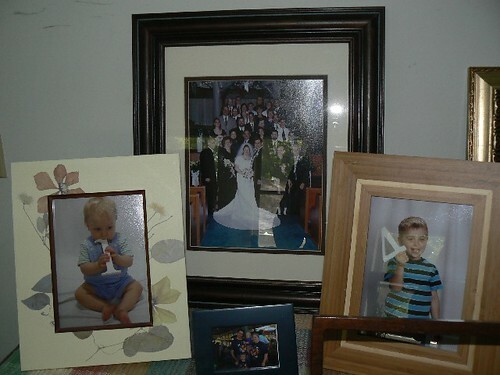 For my parents anniversary, we got them a large digital photo frame and a 4Gig memory card. Every few weeks or so, someone uploads new photos. Mine are taken from my Photobucket account. My mom said that, and the collage frame we put together a million years ago for their 17th anniversary (they celebrated their 39th anniversary in December) were the best presents we ever got them.